Carson And HUD Are Sued Over Delaying Anti-Segregation Rule : The Two-Way The federal lawsuit stems from the department's decision to postpone a requirement that recipients of funding study how inclusive their communities are and plan how to overcome historic segregation. 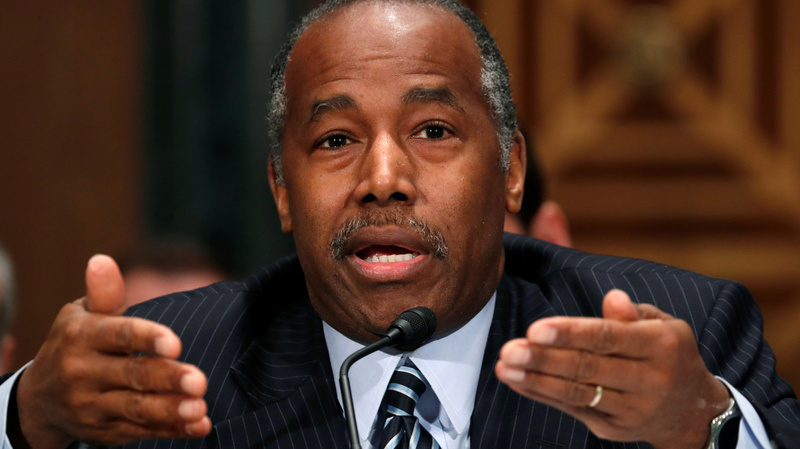 Housing and Urban Development Secretary Ben Carson faces a lawsuit over his agency's sidelining of a rule that is meant to prevent segregation in areas that receive federal housing funds. The federal lawsuit stems from HUD's decision in January to postpone an Obama administration rule requiring communities that get HUD funding to submit fair housing assessments — a step that required recipients to study how inclusive their communities are and plan how to overcome historic segregation. Without that rule, the plaintiffs say, billions of dollars in federal housing funds will be dispensed without any civil rights oversight. HUD also made the change "without prior notice or opportunity to comment," according to the lawsuit. The plaintiffs include the National Fair Housing Alliance and two state groups, Texas Appleseed and the Texas Low Income Housing Information Service. "Basically, this action, I would say is best described as lawless," Sasha Samberg-Champion, an attorney for the plaintiffs, said in a call with reporters. "There are well-established rules for how agencies can and can't go about changing their own policies," he said. "There is a law called the Administrative Procedure Act that sets these rules out pretty clearly, and HUD broke these rules in multiple ways, and it's not really a close call." The plaintiffs say that by sidelining the assessment rule, HUD is letting more than 1,200 grantees — many of them local and state government entities — receive billions of dollars annually without addressing racial segregation and other fair housing problems in their communities. "Each day HUD holds up requiring jurisdictions to fully comply with the law is another day that millions of people are being denied fair housing opportunities," said Lisa Rice, NFHA's president and CEO. "HUD's action is a clear example of 'justice delayed, justice denied.' "
HUD did not provide an initial response to the lawsuit, instead referring journalists to its statement in January. The housing assessments were required under the Affirmatively Furthering Fair Housing rule, which was published in the summer of 2015, after changes were recommended by both the Government Accountability Office and HUD itself. By requiring an assessment of fair housing, the AFFH rule was intended to make sure communities that receive federal grants and aid for housing also develop plans to address racial segregation and discrimination. For decades, the lawsuit says, HUD "inadequately enforced" the Fair Housing Act. It calls the assessment rule an attempt to fix that. But rather than renewing its approval of the AFFH rule earlier this year, the agency delayed it until at least 2020. In doing so, HUD said the program's participants needed more time and help adjusting to the new system. More than a third of the fair housing assessments that were submitted in 2017 were initially rejected, the agency said. The lawsuit comes nearly three years after the U.S. Supreme Court, in a much watched Fair Housing Act case, sided with civil rights groups on the validity of citing "disparate impact in housing cases." As NPR reported, that ruling means "statistics and other evidence can be used to show that decisions and practices have discriminatory effects — without proving that they're the result of discriminatory intentions." That 2015 ruling involved a case against the Texas Department of Housing and Community Affairs, which was accused of contributing to segregated housing patterns by giving too many tax credits to housing in predominantly black areas and too few in predominantly white areas. In the new case, Texas housing advocates say federal scrutiny is particularly needed in their state in the aftermath of Hurricane Harvey. The assessments, they say, could help ensure that the money to rebuild in Houston and other areas is distributed in an equal and fair manner. Analysis of the recovery effort in Houston has shown that "wealthier areas received more federal disaster assistance than lower-income neighborhoods," as member station Houston Public Media reports. That analysis draws on contrasts between two maps: one that shows where the Federal Emergency Management Agency has approved the highest percentages of assistance applications and another that shows the Houston area according to the Centers for Disease Control and Prevention's social vulnerability index. Even before the HUD decision in January, advocates say, they were already engaged in a long fight to change officials' thinking about segregation. "We have spent over a decade working with state and local governments to provide understanding that segregation is not an accident — it is the product of decades of intentional government policy," said Madison Sloan, director of Texas Appleseed's Disaster Recovery and Fair Housing Project.